Listen to this track by pre-fab four once-upon-a-time television rock band turned the real thing, The Monkees. 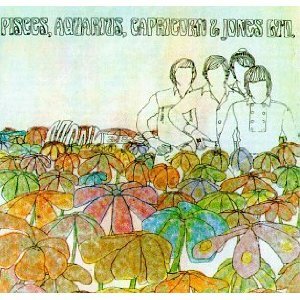 It’s their summer of 1967 single, written by Carole King and Gerry Goffin no less, “Pleasant Valley Sunday”, a tune that would feature on their TV show, and on their fourth album Pisces, Aquarius, Capricorn, & Jones Ltdin November of that same year. The song is built around a riff that echoes the sound of the Beatles circa the Revolver album, with a decidedly suburban thematic bent; the “status symbol land” of the Man In The Grey Flannel Suit, his family, and his neighbours. But, an important thing to note is that, although the Beatles are a clear musical reference point by the time this song was laid down, the Monkees were an able studio band by this point.They had honed their skills during down time as their TV show was being shot using instruments that were left lying around the lot, and had become a real band. All four Monkees play on this; Mike Nesmith on guitar, Peter Tork on keyboards, and both Davy Jones and Mickey Dolenz singing. And what a song this is, a series of snapshots of suburban American life, viewed perhaps by this time as standing opposed to the counterculture who were in the middle of their Summer of Love by this time. This is held in yet another form of opposition, seeing as it was those in the suburbs who helped to drive up the ratings of the four crazy guys whose adventures they were seeing on TV every week. This subtle biting the hands that feed would never have been allowed today. But, this song was a hit record, reaching number 3 on the pop charts. 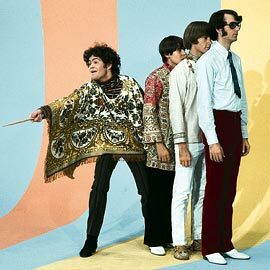 At this point in their careers as a band, there were, in the words of Mickey Dolenz “two Monkees”; the one on TV, and the one who had taken control of their own destiny as a band, recording albums, going on tour, and winning the respect of those upon which they’d been based as an act- the Beatles, among other acts of the day. Also in the words of Dolenz, “Leonard Nimoy had become a real Vulcan”. It wasn’t as if the members of the band were strangers to their instruments when they started. Nesmith and Tork were versatile and gifted instrumentalists. Dolenz and Jones were actors, primarily. But, both picked up vocal duties like naturals, with this song being a great example. With all of the waiting around that TV production often entails, and with instruments being available due to the kind of show they were making, they had plenty of time to practice. Also, the calibre of songwriting was extremely high; Goffin/King, Neil Diamond, Boyce & Hart, and many other Brill Building songwriters to boot all contributed memorable material, not to mention originals from Nesmith. To round out their instrumental prowess, the band were joined by the Wrecking Crew on several sides. It’s no wonder the records sounded so good. Yet, it’s the personal stamp of the principle four that must ultimately be credited. This song would be a part of a purple patch for this band, newly independent of their TV personas, with another tune to follow it; “Daydream Believer”. The band had a string of hits and albums between their assembly in 1966 for the TV show, to 1968 when the band broke up as a foursome with Peter Tork leaving, and later with Michael Nesmith beginning his solo career by 1970, and helping to create country-rock in the form it would take from then on. But, it was during their 1966-68 period that the band created some of their most interesting work, straddling the line between their pre-fab origins, and their capacity to create real, live pop music to be judged in the same league as those they had been designed to emulate. Graeme, yes, I certainly would have been disappointed not to hear from you. It’s was really tough to choose one song from a great singles band of the 60s (and many believe to be a competent album band too). To me, it’s the unique nature of their story that is so compelling. They short circuited the usual route to fame and artistic respect. And yet, for the most part by now, they still retain their status as a bona fide band who produced some marvelous pop music. The Jimi Hendrix Experience on The Monkees Summer Tour in 1967. I am trying to find information about The Jimi Hendrix Expereince during The Monkees Tour of Summer 1967. Drop me a email if you have any info. Another one worth tracking down. The original Colgems single and mono LP, feature a completely different mix. The vocals and music are different. Mickey’s vocal take is an alternate with unique inflections, and the resolve at the end is shorter and a little less, um, messy. The backing vocals may differ, too. Often it was a matter of having two (or more) good versions in hand, and during the era of dual mono and stereo releases, just putting both out because they could.